This article outlines how to configure your Equipment Types within the CRM. 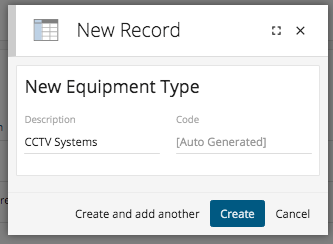 Equipment Records allow you to record the details of products that your customers have either under a service contract with you or on lease. Equipment type is used to categorise your equipment based on your own requirements. The below screenshot shows the location of the Equipment Type dropdown when a user creates a new Equipment Record. To configure your Equipment Types you will require Prospect 365 Administrator rights, if you require these then please speak to your key CRM user or our Customer Services Team. To edit your Equipment Types, click on the settings icon in the bottom left-hand corner. Once within the Settings Centre, navigate to the Equipment & Contracts section & scroll down until you reach the Equipment types configure option. By selecting the 'Click to Configure' link the Configure Equipment Types window will open. Within this window all of your current Equipment Types will be listed. To add a new one click on the + icon in the top right-hand corner. Simply give the new Equipment Type a relevant description & click Create.